ver the course of 10 years Martha Ann has traversed the country, visited numerous art exhibits and been featured in short animation. 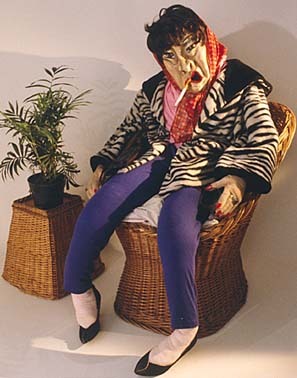 Martha Ann is a life-sized sculpture and mask, and Massachusetts native Carolyn Campbell is her creator. Carolyn's ambition is to help people achieve their dreams and Martha Ann is her sidekick. They've thus crossed the country in tandem, creating and motivating. Carolyn Campbell takes an idea, creates a frame of exploration then brings in the visual, musical, kinesthetic and ethereal. 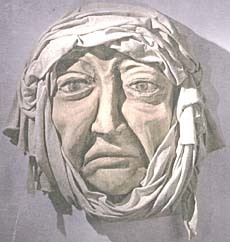 "Martha Ann," mixed media, papier-mâché mask. "I think of myself as a conceptual artist," she said. "I aim to provide experiences that allow people to deepen awareness of their most mythical self in the everyday world. My goal is to inspire their voice to rise from within and speak to their unique purpose in the world." Carolyn's Garden of Luminescent Delight is a prime example. 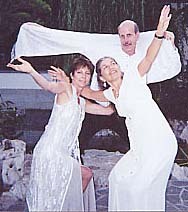 She wanted people to experience an ethereal evening of magical wonder, to experience fully "being" in the wonder of life. The setting, the timing (a full moon), the intentional dress, the music, poetry and dance  all this woven in a simple yet artistic way created an altered state of wonder. "It was truly a living moment of theater," she said. "They were in it as they watched it. They were in an ever-changing landscape of magical delight. It was all around them. Some moments slid by like a soft, floating cloud. Other moments stilled the entire gathering of 200 people and drew their attention to a moonlit corner. It was quiet, yet alive with expectation. I allowed people to sink into the delight of the senses and simply enjoy whatever they witnessed." Garden of Luminescent Delight attendees. Each year Carolyn creates a "sacred event" that allows people to look back on their year in celebration while inviting the next stage of their life journey. She is now in the midst of shaping such a ritual evening. "I go into the world looking for an environment that will provide a foundation for the evening. It's an organic and improvisational process," she said. "This year I wanted a sense of opening to a large world, a connection to the art of everyday. I'd been looking for about a month when I found the perfect space  it's full of old windows, which provided me with the title for the evening: Windows to the World. "From there the environment, the intention and the planning easily forms a transformational evening of reflection and renewal in an artistic, yet spirit-full, way." Carolyn describes the intention of her work as Divine Humanity  drawing forth the divine in the confusion of being human. 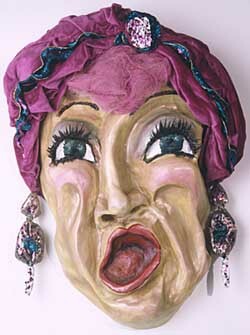 "The diva," mixed media, papier-mâché. Having just finished a show of her larger-than-life-sized masks at La Dolce Vita on Portland's N.E. Alberta Street, Carolyn is now developing a body of work focusing on fertility  of life, desire, love, creation, body ... and of letting go. Using the medium of ceramics, the project is still in the "gritty" stages of experimenting, imagining and shaping. Carolyn does have a working title for the series: "From Fertile Ground." "All my work evolves out of my own personal experiences or questing," she said. "'From Fertile Ground' is my exploration into creating and birthing ideas, visions and dreams. I found myself searching to find the vital essence of my own work in the world. I needed to find an organic form to explore what my work meant to me and what it is that I do  the deepest dimension of what I do. "I wanted to move behind the mask and into the heart, soul and blood of my own purpose." At this point, Carolyn's work is improvisational, taking slabs of clay, draping them over an amorphous form and then shaping them into an expression of fertile transformation. "It has been an exciting process of allowing myself to drop into an intuitive relationship with the clay and let the story of my own intention form itself," she said. 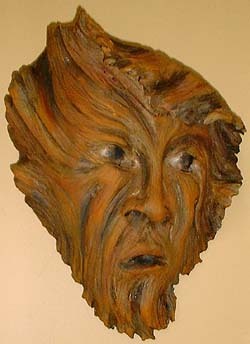 "Wizard of the Wood," papier-mâché. For Carolyn, inspiration comes from sitting on top of a mountain or watching undersea life. "It's the next frontier," she said. "These life forms have been around for millions of years and yet it's such a foreign land to us. "It's kind of like the land of the spirit body or the energetic connections between us." She's also inspired by people willing to take a stand. "Of course, speaking to people about claiming their voice in the world jazzes me beyond belief!" Her favorite artists include those of the Work Projects Administration, Kathe Kollwitz, Camille Claudel, Paul Klee and Duane Hansen. "Yes, it's an eclectic blend," she said. "Yet they are all expressive artists who explore relationship in a variety of ways." When Carolyn was young, explorers of all sorts inspired her. She would dress like them, sculpt them and draw them. In high school she designed and constructed costumes for all the school plays. "I loved expressing the essence of a person through color, form and image," she said. Carolyn's mother was "a Catholic, feminist theologian," while her father was a nuclear engineer and her strongest advocate. 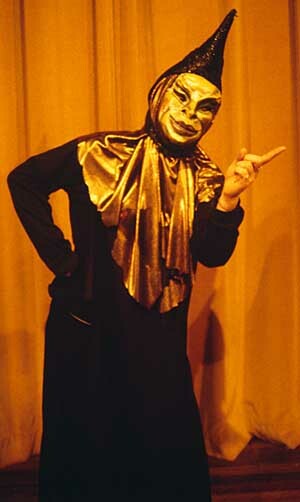 "Dad would fly in from a business trip and head directly to the high school production to see my costumes," she said. "As I track my journey, they have consistently supported my artistry. I'm sure they didn't always understand my work, but they've been willing to acknowledge its importance to me." In college, there wasn't a model for weaving together personal story, art and social change, so Carolyn pursued a BA in theater education with a recreation/criminology minor. "I remember my advisor shaking his head and saying 'Carolyn, what do you plan on doing with this?' Amazingly, I have called upon all these elements again and again," she said. "I didn't totally understand what I was 'doing,' and I'm sure it appeared erratic, because at times it felt erratic. But, as I look back, I was pioneering a way of integrating art into social change." College was the beginning of Carolyn's life-long journey to use expressive art to transform how people live in the world. 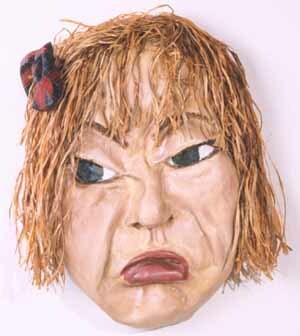 She took her first mask-making workshop in 1984 and loved it. "It gave me a structure to explore the ethereal nature of my work. Everything started to meld into a cohesive vision." After graduating from the University of Maryland with a degree in theater education, Carolyn went into Vista (Volunteers In Service To America) to work on a Living Newspaper Project modeled after the WPA's project in the 1930s. "The intent was to use art as a tool to make change in the world," she said. "During that year we used murals, plays and personal story to tell the story of life in the Southside of Columbus, Ohio. That experience pushed me to get to the heart of the story and find the dramatic form to express the power of transcending the grit of everyday survival." Yearning to return to the West Coast, Carolyn traveled to Berkeley and began working in professional theater as an intern. Over the next three years she was a costumer, stage manager, production assistant and assistant director, learning all aspects of production. Her most memorable experience was stage-managing an all-night performance for The Magic Theater in San Francisco. The series of seven short dramatic pieces was set outside, overlooking the bay. The audience walked to each site over the course of the night; each had been carefully selected for its impact. One site was chosen so the moon would rise behind the performers during the course of the action. Another for the sensual quality of the tall grass, lit in purples and blues, swaying gently under a midnight moon. For the final playlet, a 30-foot waterfall was created to "burst forth" just as the sun rose over the bay. 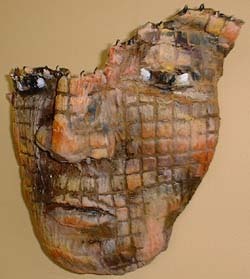 "Gus," mixed media, papier-mâché mask. "In Berkeley I worked with the best theaters, the best designers and the most respected directors," she said. "It was a great training ground, but I longed to do more experimental and transformational work of my own design." So Carolyn traveled to South Africa where she had the opportunity to see an inspiring, social-change theater performance. "I was taken by the power of personal story to shape a dynamic and riveting performance," she said. "If you've never heard of the New Market Theater, they were a major influence in getting the horrific injustices of Apartheid out to the world." 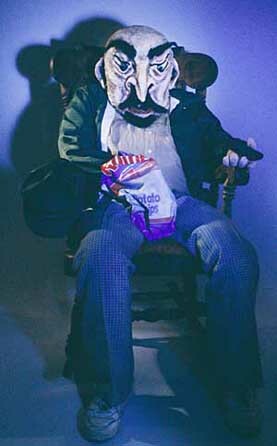 Returning to America, Carolyn began work in a variety of settings using movement, masks and personal story. In addition to her own work, she developed a partnership with Rhodessa Jones, a performance artist, to create a program in the San Francisco jails, entitled "Theater of Life and Dreams." "As much as I was excited by the work, there was a piece missing," she said. "I wasn't really sure what it was, but I again knew it was time to move on." In 1989 Carolyn moved to Portland. For the first five years she was an artist-in-residence, working throughout the country with students creating masks, murals and sculptures with the intention of drawing out their voice in fantasy, dreams and life story. In '98 she co-created a series of fanciful, life-sized safari animals with a group of inner-city students that were donated to Emanuel Hospital's children's ward. "The animals were such a hit that the hospital commissioned a group of fifth-graders to create a second set," she said. "Some of the animals' legs now have casts, and their necks needed repair work, but six years later they are still bringing joy to children in recovery." That same year, Carolyn found herself in a financial downturn. She got her first "real" job, working as a training coordinator. She was shocked at the realities of the cubicle world. "I kept thinking about the incredible work my artist friends created with minimal resources. They loved their work but struggled to bring it forth to the world," she said. "And here I was, working in a company where people had all the resources to bring their vision to the world but were disconnected from their own life purpose. "As I worked in that real world, I was struck by how many people hated their jobs. I had always followed my passion and been surrounded by others who were doing the same. "As artists, what we lacked was the marketing know-how to succeed financially." 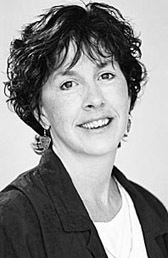 In '99 Carolyn started her Portland-based coaching practice, The CoreSource. She's worked with corporations, small businesses and artists across the country, and has helped individuals launch businesses and creative ventures while developing their unique leadership style. "I wanted to use the creative, expressive process to connect people with their deepest purpose and create exciting ways to bring it to the world," she said. "The goal of my workshops, classes and events is to help people claim their voice and shape their message through the medium of the expressive arts using voice, story, drawing and movement  to transcend the confines of everyday demands so they can imagine, create and inspire. Using art was the only way." "My Mother Cut My Hair," mixed media, papier-mâché. Carolyn's goal for her artwork has become increasingly clear over the last several months. "I want to use my work as a vehicle to connect people to their inner spirit of divine wonder within the complex world of human uncertainty," she said. "I want to continue to integrate my artwork into my public speaking, workshops and sacred events. I want to continue to evolve my work as a medium to strengthen our trust in the human spirit and our interconnectedness in the world. "And I want my work to continue to be exhibited and purchased for everyday, public spaces  cafes, hospitals, offices and, oh yes, bars." E-mail Carolyn at carolyn@thecoresource.com. Reach Kathy at kanderson138@attbi.com, and draw on other Sketch Pads.